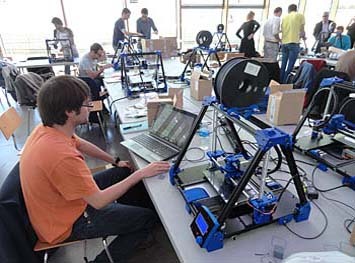 Last weekend CATUAV participated in the RepRap workshop in Barcelona building and testing a 3D printer. The new BCN3D+ printer developed by the Fundació CIM offers unmatched price-performance ratio, is based on open technology and has a large user community that enriches with their contributions the original design. CATUAV congratulates the Fundació CIM for the dissemination of 3D printing technology, which CATUAV plans to use to provide greater flexibility and speed of construction on the new designs. CATUAV en el Marco del Programa de Iniciación a la Exportación del ICEX, ha contado con el apoyo del ICEX y con la cofinanciación del fondo Europeo FEDER. La finalidad de este apoyo es contribuir al desarrollo Internacional de la empresa y de su entorno.